I wholeheartedly disagree with that sentiment. I mean, this has been a series filled with war and epic battlefields, we're not more than a few episodes removed from the latest (not to be confused with the last), and now those days are done!? Ok, I went a little overboard. Obviously I can't rightfully make that claim given all the possibilities currently open before us. My response was directed at Deci's post regarding Guts leading an army -- I don't see Guts leading an army of Elfhelm participants against Apostles and Falconia in general. It doesn't seem his style, and I think that part of his life is over. Right now, as the circumstances currently are, I'm reaching out with my Berserkian eye and ... just not seeing a traditional army vs army clash in the end. Am I giving that my Wally Official Seal of Inevitability? No, but seeing as how the world has become far more gray than black and white in recent episodes, I just don't see that happening. I don't understand the rationale behind the bold proclamation that that aspect of the series is over, when it may not have even begun as Miura can imagine it between the forces of good and evil. Well that brings up another point. What we witnessed in vol 34 was the biggest and most dramatically drawn battle of the series thus far. To me it felt like the end-all, be-all of large-scale "military" battles. I'm unsure if it can be equaled, nor if Miura has the desire to equal it. It could stand as the bookend to that kind of conflict. Anyway, I never meant that there wouldn't be an epic battle in the end. Given the scale of the series I think some kind of grand show is certainly in line. I just don't think it will be a traditional one, the kind that Deci seemed to be implying, that we've seen in the previous age of the world. Ok, that's fair, but one might have thought the same thing about Guts even having companions again, as he himself did, before forming this little band. Or, about Griffith after the Eclipse, and that would have seemed an even safer bet. I still remember the reception Olivier's incarnation post got, the same anybody would get with such "speculations", so far out there from what we currently know. Until it becomes the norm, it's abnormal. But, Guts was a great commander, so why shouldn't he be again? Because that's not what we've come to expect from him anymore? It doesn't fit his Black Swordsman style? Neither does a lot of things we've seen since he reunited with Casca, it's just that we're willing to accept it all when it's right in front of our faces. Once it becomes the norm, it's normal. So, maybe it's really that part of his life that's over. I don't know, again, it might be simple, or wishful thinking, to imagine Guts at the head of an army opposing Griffith, but sometimes, as was the case with the Apostle Army, the simplest ideas are the right ones. Anyway, I wouldn't dismiss it, even if it turns out not to be. Though, I must ask, why did you emphasize his? Kidding aside, the "grayness" is what makes me think anything is in play, because we have absolutely no context. It doesn't have to be black and white, or simple at all. Imagine if one of us traveled back in time and tried to explain the whole Ganishka and where that went to the board before it was an obvious reality we'd already passively accepted. Pfff, semantics. That was in the arc about the ship from Star Wars, right? Well that brings up another point. What we witnessed in vol 34 was the biggest and most dramatically drawn battle of the series thus far. To me it felt like the end-all, be-all of large-scale "military" battles. I'm unsure if it can be equaled, nor if Miura has the desire to equal it. It could stand as the bookend to that kind of conflict. I like the symmetry of the bookend idea, but I still disagree with your overall point there, because one could argue it was as much ceremony as real ultimate battle. It was basically Griffith toying with his own figurehead fall guy Emperor, whose purpose was to oppose him, and to fail and become wood. He didn't even get to stain god as far as we know. Anyway, I'd like to think Miura is going to blow that spectacle, awesome as it is, out of the water. I can't expect any less. Anyway, I never meant that there wouldn't be an epic battle in the end. Given the scale of the series I think some kind of grand show is certainly in line. I just don't think it will be a traditional one, the kind that Deci seemed to be implying, that we've seen in the previous age of the world. The idea of Guts leading an army does seem far off. His personality as of late (to me, anyway) has become reserved, almost sage like. Not at all like his old raiders self. Does that mean he still can't lead the way he used to? Certainly not. But it would seem odd, to say the least. I still remember the reception Olivier's incarnation post got, the same anybody would get with such "speculations", so far out there from what we currently know. Not the same thing at all. At the time (around when vol 18 was had just been published, I think), Olivier knew things we didn't because he could read the text. We couldn't, and wouldn't really for a long time. So of course there was some disparity of understanding. Here, everyone's on the same playing field, with the same rules. Some people are willing to make assertions about the future based on the past, despite the fogginess ahead, and others are cautiously holding off their opinions. That's all we're really talking about here. Until it becomes the norm, it's abnormal. Well, where we disagree is that I believe that the next step down that line of reasoning is to never make any assertion other than "Wait and see. Because you never know!" I'd rather tumble around with ideas on the future, even if they are hindered and colored by our current perceptions than sit back and wait until they're certain. But, Guts was a great commander, so why shouldn't he be again? There's an important distinction to be made here. He was a good raiding captain. But in the Hundred Years War, he took his orders from Griffith. He didn't organize the overall strategy of a battle. Not to knock Guts at all, but he's no schemer. By his own admission, he goes with things based on honed instincts and makes successful split-second decisions in combat. Not so sure that translates into being a great commander in the sense you mean. It was just a response to your "and now those days are done!?" They're done for HIM, imo. Kidding aside, the "grayness" is what makes me think anything is in play, because we have absolutely no context. It doesn't have to be black and white, or simple at all. My black and white comment was a response to your "it may not have even begun as Miura can imagine it between the forces of good and evil." Well, I was arguing it based on the drama of the art Miura chose to depict the scene in and the scope he later included as a result of that clash (the world being eclipsed in a mysterious light). It's all pretty massive stuff, visually, whether it's in principle a spectacle or not. but do you really think what we just saw was "traditional?" I feel like Serpico when he remarked, "What's the usual?" I didn't say that was traditional. I meant that I don't see Guts at the head of a traditional army in the sense Deci was implying. You know, like the Falcons. I was only making the point that the our preconceived notions can be a hindrance to our assertions about the future. I don't think it's an either/or choice, as a matter a fact, keeping that disclaimer at the forefront allows for much bolder speculation. I just don't like acting certain about things we can't be certain about, especially if we're trying to represent the objective facts as best we can otherwise. It's fine to to debate opinions and ultimately disagree, but I think we owe it to our own selves to keep an open mind as well when we clearly can't know. Anyway, what I meant by, "Until it becomes the norm, it's abnormal" wasn't how I feel about these things, but how this idea of Guts at the head of an army hasn't been the norm for a while, so of course it seems abnormal. Or, any speculations that don't currently follow the norm seem abnormal and therefore unlikely by default. That's a good way to eliminate the nonsense, but I don't think this can be ruled out as such. We're talking Guts going to war, not opening a ballet studio; there's precedent, he's been on the battlefield his entire life, growing up around and eventually into leadership roles, high on the chain of command of the most powerful army in Midland, and seemingly a charismatic, beloved, and natural leader of men, so it's not that big a stretch that he could take an army into battle again if it came to it. I'm not saying it's anymore likely to happen than half a dozen other scenarios, but it wouldn't surprise me either. Well, I wouldn't get into any heavy specifics for the same reasons I wouldn't dismiss the general idea, but he could pretty much just be raid captain of the Band of the Skellig or whatever and I'd be satisfied. Hell, it wouldn't even have to be that organized to simply put Guts' leadership qualities and battle charisma (I think just made that up =) into action with an army. With his past experience, and a little personal growth, the potential is certainly there for him to do something big in a situation like that. Worst case scenario... he'll be Skully's second in command! I threw that in there just for example, sounds better than side A versus side B. It's fine for you not to see it, but that doesn't make it unreasonable to see, so to wrap things up, let's agree to disagree? Worst case scenario... he'll be Skully's second in command! This was all fun and games until you went and made me ruin my pants with that line. Thanks. ...to wrap things up, let's agree to disagree? This discussion reminded me of one of Griff's old avatars that flashed between Guts and Griffith with different colored Band of the Falcon flags, almost like they were opposing commanders. Whoa, nice discussion Walter and Griff, I enjoyed the read. You two pretty much covered everything, 'specially Griff, I was thinking without going too far into speculation (as I tend to do). I meant that I don't see Guts at the head of a traditional army in the sense Deci was implying. You know, like the Falcons. My post was a little too vague, I wasn't trying to imply that Guts would lead an army of "normal soldiers", like we saw during the 100-year war, but an army more fantastic. People with extraordinary skills like the Bakiraka, or perhaps some fresh meat from Elfhelm, for example. The little blurb I said about Gaston and such was just nostalgia and me getting a little teary-eyed. Not to say it's impossible, but I doubt soldiers like that will be a part of Guts crew ever again. I want to see Zodd and Guts team up one last time. I still hold that particular scene in my special place. Talk about "unlikely" things that actually happened. Not sure if this has been mentioned but... where in the hell is Silat in all of this? I am wondering if he knew what was coming and him and the Bakiraka got the hell out of dodge to some where unknown. Also.... why is Guts still wearing the Berserk Armor? Isn't it a much bigger liability nowadays? Especially with the Beast giving his little spiel. They were watching from afar, hidden in the trees. They were doing fine when we last saw them (in episode 307). He's wearing the armor because he's about to fight a giant monster and well, better have an armor than not to have one when you do that sort of thing. Also, the Beast of Darkness actually told him it would leave him alone for now (but Guts couldn't really remember what had happened in his sleep anyway, so it's moot as far as his decision to wear the armor or not goes). Not sure if this has been mentioned but... where in the hell is Silat in all of this? I am wondering if he knew what was coming and him and the Bakara got the hell out of dodge to some where unknown. Yeah, he and the Tapasa are in the woods behind the Pontiff and the aristocrats. You can see them right up to episode 307, on page 5. It'll be interesting to see what will become of them now. Might they wander into Falconia too, transfixed by it's universal majesty!? Or, probably just leave discreetly. Also.... why is Guts still wearing the Berserk Armor? Isn't it a much bigger liability now a day's? Especially with the Beast giving his little spiel. You make a good point that it might serve Guts better to heal up and try fighting without it now, but that may simply not be feasible at the moment. Remember, it wasn't long ago he was unconscious with a fever, he's not in shape to fight without it now, not against the enemies he faces, and the armor only exacerbates that, a vicious cycle. Plus, as Aaz said, though he was certainly capable of facing such enemies before and in great pain, it's hard to leave a trump card like that on the table, especially since it's not much different putting your life on the line anyway. Guts is addicted to a performance enhancer! I think all his kills after using the armor should have an asterisk next to them in the kill roster. He's also still suffering from the wounds Slan gave him so I don't see why he'd leave the armor behind now, especially when he's worn it in every battle since he got it. He's also still suffering from the wound Slan gave him so I don't see why he'd leave the armor behind now, especially when he's worn it in every battle since he got it. Indeed, and getting chomped into by that Makara probably didn't help much, either. True, but that was a wound to his physical body, not his spiritual one. As grievous as the puncture the Makara gave him was, the wounds inflicted by Slan are way more serious. True, but that was a wound to his physical body, not his spiritual one. As grievous as the puncture the Makara gave him was, the wound inflicted by Slan is way more serious. Oh, I certainly do agree with that. Just saying, getting bitten into by a giant magical beast couldn't have been fun for him, at all. As grievous as the puncture the Makara gave him was, the wound inflicted by Slan is way more serious. Slan gave him two wounds. One on the chest and one on the back. Whoops, you're right. I can't believe I forgot that he has one on his back, too. I am sure this has been talked about but I will go ahead and bring it up anyways. Wasn't it assumed that when the wave hit everyone that many wounds and what not were healed? Also since all the layers are mergered... wouldn't it be possible that maybe those Astral wounds would heal like normal given time? I think this was brought up in another thread already and the general consensus was that while the wave accelerated the healing of minor injuries, much like Flora's mansion did, it probably couldn't heal wounds of the magnitude of the ones that Slan gave Guts. No. Quite simply, Slan's wounds won't heal the same way precisely because they're spiritual. 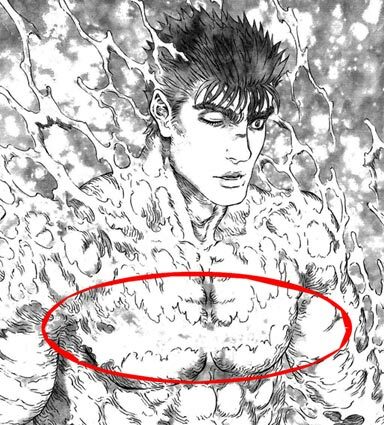 They scarred Guts' spiritual body. In vol 24, Schierke says minor wounds of the group were healed while at Flora's because their "physical bodies adjusted to the forms of your essential ethereal bodies." Slan's wounds weren't only physical. They went deep. This was discussed many times over in the past few episode threads.